LabelMate’s Constant Adjustable Torque™ ("CAT") technology has made the silent, easy-to-use CAT-3 the "Industry Standard" Label Rewinder. There are no awkward troublesome belts or clutches. The CAT-3-CHUCK includes LabelMate’s durable "Quick-Chuck" quick-locking Core Chuck, permitting the fastest loading and unloading of cores and label rolls. The CAT-3-CHUCK is ideal for label slitting applications, high-volume production environments, or anywhere the ultimate convenience in rewinders is desired. The CAT-3-CHUCK is also available with Quick-chuck shafts for 38, 40, 44, 70, 76 and 100 mm core diameters. Handles labels upto 170mm wide. 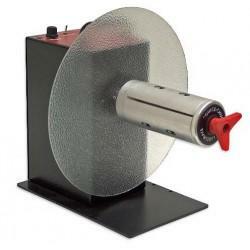 Accepts label rolls upto 300mm in diameter. Variable torque for gentle or powerful rewinding. Additional guide discs available upon request.